"Try to use a Command Seal on me, 'Master', and I'll blow your hand off before you can utter the words. As long as you understand that, I'm sure we'll get along just fine." True Name: Harriet Tubman "American Moses"
A strong-willed and taciturn woman, preferring action over deliberation. When not engaged in battle or reconnaissance, Archer enjoys simply finding a quiet place under the night sky to lie back and watch the stars. She dislikes being called a Servant and will demand her Master treat her as an equal upon summoning. As long as her Master treats her respectfully however, she will respond in kind. The ability to sustain oneself in existence without a supply of Mana from one's Master. 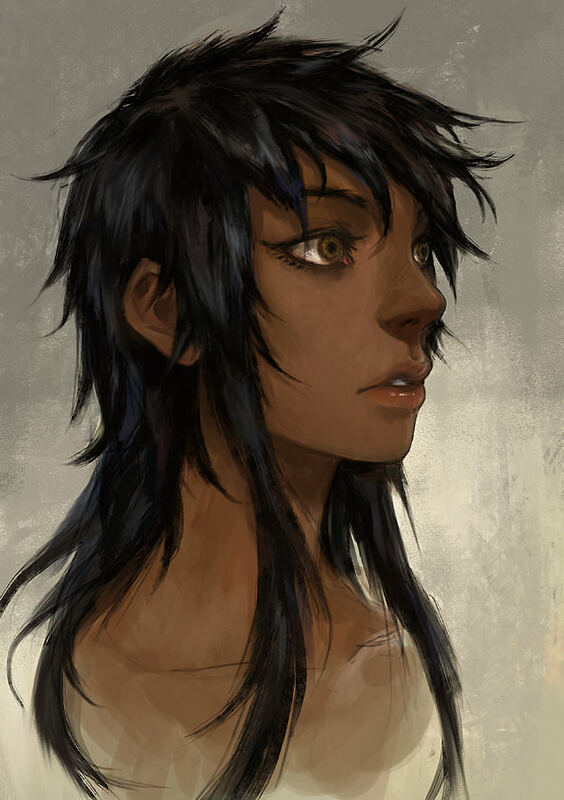 At A-rank, Archer can linger in the world for up to a week in the absence of an active contract, and continue fighting after suffering extensive damage to her spiritual core. Archer's resolve to never again endure the shame of slavery has granted her a high rank in this Skill. Confers protection against magical effects. At this rank, spells with a chant below two verses are cancelled. Cannot cope with the likes of High Thaumaturgy or Greater Rituals. Archer picked up a modest level of resistance due to defending against the Magecraft of slave-catchers. It has been further bolstered by her unwavering religious faith. Denotes one’s status as being a ray of hope to the oppressed, admired by those who seek freedom. The oppressed and freedom-seekers alike instinctively flock to Archer, seeing her as the Messiah who will guide them to the promised land of liberty. A fascination magic-like effect that works on both men and women. This Skill also boosts damage from Archer's attacks against individuals associated with the slave-trade. Archer led as many as 300 slaves to freedom in her many expeditions across the Underground Railroad, being revered by some as the second coming of Moses. The ability to "hear the voice of the heavens" and take optimal action. Equivalent to Instinct; a sixth sense regarding battles, but Revelation accomodates all matters related to the achievement of a goal, such as choosing the swiftest path while travelling. After being struck on the head by a metal weight while defending a fellow slave from his cruel owner, Archer suffered migraines and vivid hallucinations for the rest of her life. Being a devote woman, Archer interpreted these visions as revelations from the Lord guiding her to deliver her people from slavery. Possession of an iron will that reduces damage from physical and mental attacks. Even after escaping the hell of slavery, Archer repeatedly chose to venture back into that hell to rescue others from the same fate. No matter what perils and hardships she faced, Archer never once faltered from her path. A Skill given to military-affiliated Servants. By grasping and analyzing the situation, correct advice can be given to one's allies. The higher the rank, the better the probability of the advice given being correct. Archer served as a scout and advisor to the Union Army during the Civil War. By scouting out the terrain and locations of enemy troops, Archer can formulate a plan to maximize her allies' chance of victory. A Noble Phantasm crystallizing Archer's role as a conductor of the Underground Railroad, guiding countless escaped slaves to freedom. Gathering the hopes and wishes of the escaped slaves she led into her saint graph, Archer charges forward while engulfed in an aura of blazing golden light that takes the form of a heavenly train carriage. While charging, Archer cannot be stopped by anything. Evoking the imagery of Moses parting the Red Sea, attacks and obstacles in her path simply slide off her like oil from water. The effect of this Noble Phantasm lasts for only a few minutes, and only as long as she continues moving forward in a straight line, but for those minutes Archer is immune to all attacks that would interupt her march towards freedom. Only Noble Phantasms ranked A+ or higher and attacks from those with a C-rank or higher in Divinity can bypass this protection. After doing Turner yesterday, I decided to write up another famous black hero(ine) as a Servant. Her personality ended up a bit simpler than usual since I already used up some of my ideas when describing Turner. Still, I'm pretty satisfied with how she turned out overall. Oh and, thanks to AridWolverine for inspiring me with the Symbol Of Freedom Skill he used for his William Sherman sheet. It really fit her. Last edited by RoydGolden; July 12th, 2018 at 01:42 AM. Update: So I just gave Tubman Advice Of The Strategist to represent how she served as an advisor to the Union during the Civil War. Any thoughts on the sheet? Likes: honor, wine, happy endings, romance, sweets. Dislikes: tragedy, unhappiness, coffee, sickness, dishonor, and water. Thou he is able to be summoned as an assassin, he is not famous enough for any stealthy or covert action during his life, as such he only gains teh bare minimum rank granted to him by virtue of being in the assassin class. His presence is only somewhat difficult to pinpoint. as somone legendary for the fact that he never once took a direct hit in any of his matches, he has a decent rank in this skill, while active he is granted a full rank up to his endurance, and gains a considerable restitance to poison. a blessing granted to melonkomas do to the philosopher dio having dubbed him the absulitly best athlete he ever knew, and thus build the legend of melonkomas, this skill is only active when adhereing the to the rules of Ancient Greek boxing, while active melonkomas gains a full rank to strength, and a + parameter to agility and endurance. A skill melonkomas devoloped in his life go hide his super human abilities, so he wouldn't forced to kill monsters or join wars this skill while active not only hides parameters, but also makes it difficult to discern him from normal humans allowing him to hide plane sight though presence detection of A rank will null this skill. Backstory: melonkomas was one of those men born with superhuman abilities during age of gods, however after he grew to a certain age and hearing the tales of heroes and their deeds, he came to the conclusion that the life of a hero would be one soaked in blood and tragedy, and recognized the killing potential his strength had he begun to fear his own strength, and did not want to cause or become the victim of tragedy. But yet he knew that if any of the kings found out about super human strength and agility he'd be forced into war or worse. So he hid his own strength, and deciding that he wanted to use his capabilities to inspire joined the Greek boxing matches, we he quickly drew fame and recognition, specifically for his style involving never taking nor receiving a hit and waiting for his oppenent to pass out. He eventually died from an illness. Personality: he his a fun loving individual, who enjoys sweats and sparring with other openents, he wishes to face an ultimate oppenent however this is only a secondary wish. He also fights with honor and while fighting oppenenthe will give them advice, and even tell them their own weaknesses. His ultimate wish for the grail is to change the fate of things that have and will live from one of a tragic ending to a happy one. 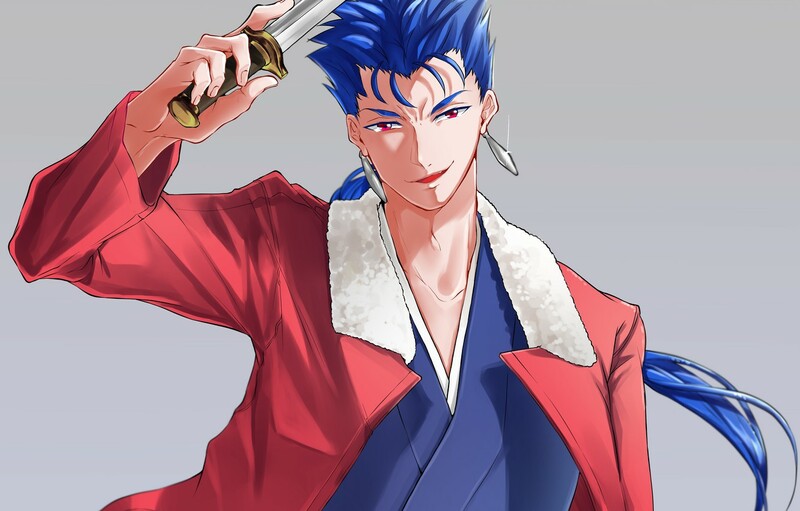 He fights and attacks with no hit of mallace, however he is not without malice but simply puts an effort not to feel malice, for example it would be impossible from him not to hate with murderoes intent idviduals like Gilgamesh or those who attack his master. He still fears own strength thou not as much as he did in life, and looks at most heroes with pity rather then contempt as he sees being hero to be the same as having a tragic end. title: I who have never received nor given one shall not loose this day. Once activated a bounded field that is the size of typical Ancient Greek boxing rings will be summoned around him, those servants who are in the bounded field or enter will not be able to leave until they die or admit defeat. The bounded field possess the ability to impose impossibility on his opponents, while in the bounded field so long as melonkomas is not actively attacking he cannot be hit by attack from openents inside the bounded field, however attack from outside can hit him thou he gains he considerable increase to his ability to dodge attacks so it would be difficult from anyone either then archer to perform a succefully attack on him from outside. For each unssuccfull attack from those inside the bounded field the mana required for attacking, and even existing doubles, and then doubles from there, thsi represents him waiting for his openents to pass out or quite. However should he feel mallace towards anyone inside the bounded feel the bounded feield will weaken and disappear altogether. Also since he only has enough mana to last about 5 min he's unlikely to just not attack since he has to kill the servants within 5 min since that's the maximum he can keep the bounded field up for. Last edited by venomking; July 13th, 2018 at 11:31 AM. Last edited by King of Padoru; July 12th, 2018 at 10:10 AM. Still no commentary on my Tubman? Last edited by SnowPrincess24; July 12th, 2018 at 02:22 PM. As a general heads up for the future, openly asking for feedback makes me want to comment less. Overall cool, but I'm not sure about Advise of the Strategist. I wasn't sure either, but I wanted a Skill to represent her being an advisor for the Union during the Civil War. Since this getting sniped by canon, RIP the original European Confederation leader Servant. I also get sniped for my idea of Archer with Back-Up Fire as a Skill. "Impossiblity itself is impossible for me." Having B Rank in this Skill is sufficient to lead a nation as its Emperor. The moral of military forces he commands is extremely high. Tactical knowledge used not for one-on-one combat situations, but for battles where many are mobilized. Bonus modifiers are provided during use of one's own Anti-Army Noble Phantasm or when dealing against an enemy Anti-Army Noble Phantasm. At B+, he has mastered every modern tactic possible and able to easily read the enemy's tactic. As long as the tactic is utilized on the battlefield, he can make a counter tactic against it. Tactics used from month of prior planning such as Strategy didn't gain bonus. The 'talent' to collect high-quality goods—a 'luck' that draws rare items into the possession of the Servant. It possible to gain NP of fallen Servant nearby, but the usage will be considerably lower or can't be used at all. Being an emperor that have special love for historical artifacts, he is granted this Skill. Innovation possessed by Napoleon. It is a conceptual revolution of favoring efficiency over social status. It grants him a special advantage to those who bound with old social systems like monarchs, their knights and even to those who subjected by it; such as King Arthur. It doesn't give him an advantage over people who rebel against similar subjects or modern heroes from a later time; such as Spartacus. As many heroes hail from powerful kingdom one after another, this is a very powerful Skill. Since he was summoned from his home domain, he has summoned under the aspect of Napoleon the hero emperor. Due to that, the Skill has turned into something positive in effect. It allows him to be viewed as 'greater than he actually' is.' Enemy or ally will perceive his Skill, Parameter, and NPs as ranked A or above. The Grande Batteries manifest as powerful artilleries that pulled by horses for high mobility. The batteries can be summoned en masse without the horses to conserve mana usage, but become immobile as a result. Activating its true name will fuse all the Grande Batteries in the area, becoming a single giant cannon that fire off a thunderbolt that vaporize all enemy in the line. The national anthem of the French Empire. Based on Napoleon's impact on Europe and the world and his famous phrase 'the word impossible is not in my dictionary' manifested as a Noble Phantasm. A Noble Phantasm that paints the area with the triumph of Napoleon. Phantasmal drummer and trumpeter march from every direction humming his greatness. Inflict direct rank down to any Servant's Saint Graph that heard the resonation of the instruments, their performance will be greatly reduced. Their Skills and NPs will gain a special negative status 'possibility down', making them has a great chance to fail or displayed improperly. A strict and overly serious man, but also a hyperbolic ham. 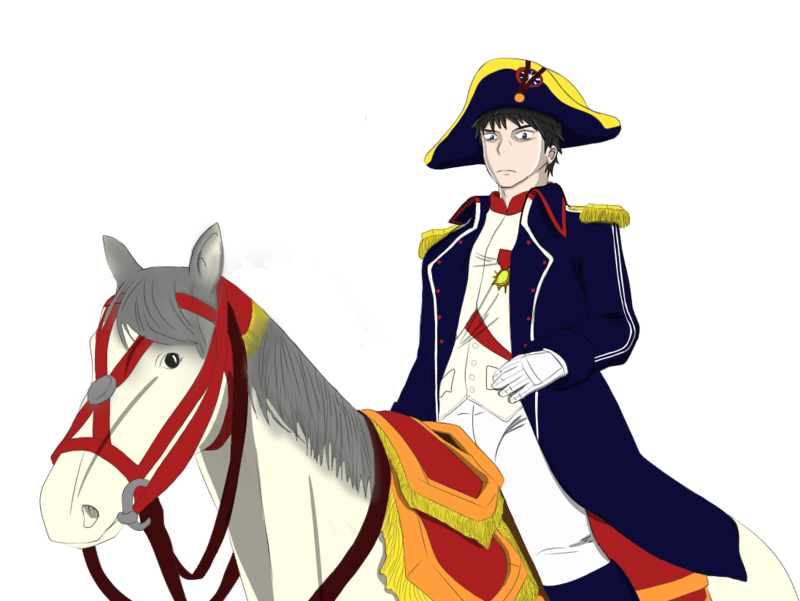 Napoleon Bonaparte, France's greatest hero, and worst tyrant. A genius among warfare geniuses, he continues to demonstrate that the impossible can be done. Making peasants able to enter the government. Capturing Mediterranean Europe into his own. He steals the greatest Mystery the world has to offer, that is [Impossibility]. He becomes the star and hope for the subjected, at the same time, the doom and despair for the rulers. Soon, Napoleon's name was spread, and his ideal is heard all across the world. Country after country installs his code, establishing him as the law even outside of his domain. Even his Empire is short-lived, his ideal is immortal. That is, the greatest revolution in the entire world a man can do. And now, he manifested as the emperor that changes the World of Man. He once again wishes and aims for the same thing he tries to do in his life. Revolutionize the entire world into his own. A worthy opponent, the only one. The Duke knows he was the inferior general, but nonetheless, his relentlessness caused the impossible become possible unto Napoleon himself. That is to say, the Duke himself represents the symbol of Napoleon's legacy cherished forever to mankind. A contest for determining the number 1 military commander is inevitable. Have similar skillset, he smirks because he think his are better. "The symbol of French royalty and the symbol of French revolution. We are meant to be something incompatible, but just like there is no impossibility for France, our own way to express love to the nation can be worked out too." "Wahahaha! This is great, you are great, I am great! Many times I controls the media to represent myself as a hero, and look at you! That height, that proportion, that friendliness, the hope of humanity! Wahahaha!" Joseph Bonaparte as a drunkard that likes destroying churches when? Given Napoleon destroyed the Holy Roman Empire, I wonder what kind of interaction he'd have with Charlemagne (Saber or Ruler versions). Mine will trash talk, but the canon one probably acts laidback as ever. I added relation with canon Napoleon if anyone care. Last edited by Spartacus; July 13th, 2018 at 12:48 PM. Wait, has Lostbelt Archer been confirmed as Napoleon? Last I checked that was still up in the air. I was just using Lostbelt Archer as a title since that's what people called him before his true name was revealed. I didn't mean to imply he was a Servant from a Lostbelt history like Ivan. Is he Napoleon, in any case?